It appears for founder, songwriter, and vocalist Giancarlo Floridia and his Faithsedge project two things are predictable: consistency and change. Yeah, that sounds like an oxymoron, a contradiction in terms. But, for his third album, Restoration, I can prove it. 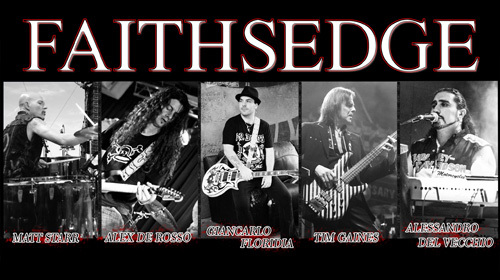 First, as for change, Faithsedge has never really had a stable lineup. Floridia is the focal person, obviously, but he changes personnel with each album. Some remain from the last album: former Dokken guitarist Alex De Rosso and Alessandro Del Vecchio (too many credits to mention), producing and providing keyboards once again. Newcomers include Stryper bass player Tim Gaines and drummer Matt Starr (Ace Frehley, Mr .Big). There's lot to be said for having top-notch people in your camp, especially when you're creating classic hard rock. And that leads to the consistency. Floridia writes and creates classic melodic hard rock with a heavy metal edge. The latter was bumped up on the last album and, I would contend, it's even more prominent now. There's some really hard charging barn burning songs here like Taking Our Lives, This War, Regret It All, and Her Way Back. That last one has the bristling riffs and pace to come close to being power metal. The description should probably the reverse: the tunes here are melodic heavy metal with a strong rock groove wrapped in AOR sensibility. To be fair, there are some slightly milder songs like Faith And Chris, something of an emotional power anthem. Also there's Let You Breathe, a song built upon vocals over acoustic guitar at the start, yet all pushing to a rising crushing crescendo. Along the way Floridia, as a vocalist, has not sounded stronger. And the guitar work, the riffs and solos are monstrous and appealing. Also, having Del Vecchio behind the knobs makes this entire recording sound both larger and more polished. All in all, I would say Restoration is Faithsedge, Giancarlo Floridia and friends, best and strongest album to date. It definitely puts the heavy metal into the hard rock groove. Recommended. 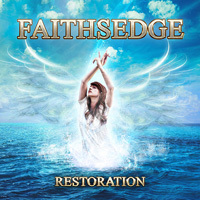 All in all, I would say Restoration is Faithsedge's, Giancarlo Floridia and friends, best and strongest album to date. It definitely puts the heavy metal into the hard rock groove. Recommended.